The San Diego Rock and Roll Marathon is this Sunday, and a good friend of mine is running in it. She has been training with Team in Training, and raising money for the Leukemia and Lymphoma Society. I made this card for her to celebrate her race. 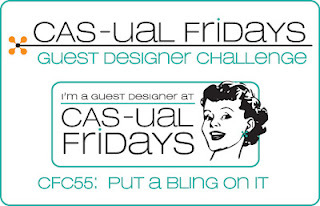 I am entering this card into this week's CAS-ual Friday's CFC55 challenge to 'Put a Bling On It'. The strip near the bottom is MS Turquoise glitter, and there is a little gem on the Hawaiian Shores guitar. I like how you can still kind of see the checked background through the glitter. Purple and Turquoise are the official colors of Team in Training. I also had made her a set of Purple and Turquoise thank you cards that she could use to send to her donors, and I will post that later, if I can find my pictures. Here is the first card I made to send to her to celebrate her finish. When I saw the PTI group posts this morning using Boy Basics, it reminded me about the guitar in Rock On. So, I will save this card for something else. I also made a card for last week's CAS-Friday's challenge to make a masculine card using patterned paper. I missed the linking deadline, but I will be on time for the occasion, which is Father's Day. I was inspired by this card by Jenny. Joyce all three cards are fantastic! I love your rock on card. You have so many amazing impression plates, that one is on my list. The guitar are so fun. Second, your felt flower card is lovely. You do such a wonderful job with your medallion (also on my list)stamps, thanks for showing the inside. Finally what a perfect Father's Day card, I really like that patterned paper. You have been busy today. Wow, those guitars look so good stamped in those bright colors onto the sunshine IP! They are perfect for your friends event and so nice that you coordinated the event colors into your card. I also really love that felt flower card...you couldn't have stamped those medallions more perfectly! They line up so well, I had to double check to see if they were patterned paper! Great job and it looks like you have been very crafty this weekend! And way to go on Dad's day!! Joyce, I love all three cards! The glitter is fabulous! You know me and my love of glitter. I love your use of Boy Basics, too. Fabulous for girl or boy. I love your Father's Day card. So sorry you missed the deadline, but it is still a fantastic card. My daughter was supposed to make her Papa's card today, but we just didn't get to it. Maybe tomorrow. Hope the race goes well for your friend! You have been one busy little bee! Your rock on card is my favorite of the bunch, it reminds me of Ashleigh and today she is at an all day concert and without me...oh well. Love the colors and how you have the middle guitar a die and popped it up and the little bling on it is such a fabulous finishing touch. I am sure your friend will love the card, no matter which one you send. I plan on casing it because I have a close friend participating in an event up here. I still need to make a Father's Day card and love how elegant yours is, may just have to case that one as well. Great work today! Fabulous cards Joyce!! I love the colors and the guitars and the bling on the first card. Love the felt flowers on the 2nd card, too!! Hi Joyce, my you have been busy and all the cards are so different! I think the one with the guitars is so perfect for a rock and roll marathon! great cards! love the guitar card...the colors and textures are perfect! Wow! All of your cards are awesome and so thoughtful of you to make a card for your friend running the marathon. That is a huge accomplishment! Thanks so much for joining us at CAS-ual Fridays! Joyce ALL 3 cards are FANTASTIC!! You have been BUSY BUSY!!! :) I see you have more for us below.. of to peek at your other blog posts! :) Have a GREAT day! Hi Joyce! I love all of these. love the color combo of the turquois and purple so much. Love the bling on the guitars and the embossed background is perfect. Love the flower on the second. The father's day card is wonderful - love that striped IP. Gonna have to pull mine out! Wow, you have been busy! These are all fantastic! Love the turquoise & purple and every time you use the medallion stamp I think it is patterned paper--awesome job of stamping! Great Father's Day card too! These cards are all fantastic, Joyce! I especially love the guitars on the first one, which are perfect for a Rock & Roll marathon! I'm a big fan of the Team in Training, since a dear friend of ours passed away from lymphoma 2 years ago. I'm sure your friend will love the card you made to celebrate her accomplishment! These are all fabulous Joyce, I love the guitar card, so much texture and interest, yet still CAS in design, love it! Thanks for the shout out ... I love the patterned paper you used on your fathers day card.